Mitte is the first an maist central burgh o Berlin. It wis creatit in Berlin's 2001 admeenistrative reform bi the merger o the umwhile destricts o Mitte proper, Tiergarten an Wedding; the resultin burgh retained the name Mitte. It is ane o the twa burghs (beside Friedrichshain-Kreuzberg) which comprises umwhile Wast an East Berlin destricts. Mitte encompasses Berlin's historic core an includes some o the maist important tourist steids o Berlin like Museum Island, Brandenburg Gate, Unter den Linden, Potsdamer Platz, the Reichstag an Berlin Hauptbahnhof, maist o which wur in umwhile East Berlin. Note that when Berliners speak o Mitte, they usually refer tae the smawer locality an no tae the lairger borough. Mitte (German for "middle", "centre") is locatit in the centre o Berlin alang the Spree River. 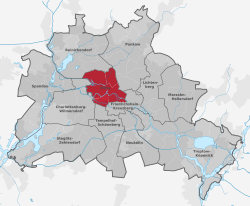 It borders on Charlottenburg-Wilmersdorf in the wast, Reinickendorf in the north, Pankow in the east, Friedrichshain-Kreuzberg in the sootheast, an Tempelhof-Schöneberg in the soothwast. In the middle o the Spree lees Museum Island (Museumsinsel) wi its museums an Berlin Cathedral (Berliner Dom). The central square in Mitte is Alexanderplatz wi the prominent Fernsehturm (TV tower), Germany's heichest biggin, an the lairge railway station wi connections tae mony subway (U-Bahn), tramway (Straßenbahn), ceety trains (S-Bahn) an buses. There are some important streets which connect Mitte wi the ither boroughs, e.g. the boulevard Unter den Linden which connects Alexanderplatz tae the wast wi Brandenburg Gate an runs further as Straße des 17. Juni tae the Victory Column an the centre o umwhile Wast Berlin in Charlottenburg, or Karl-Marx-Allee frae Alexanderplatz tae Friedrichshain an the eastren suburbs. Wikimedia Commons haes media relatit tae Mitte.